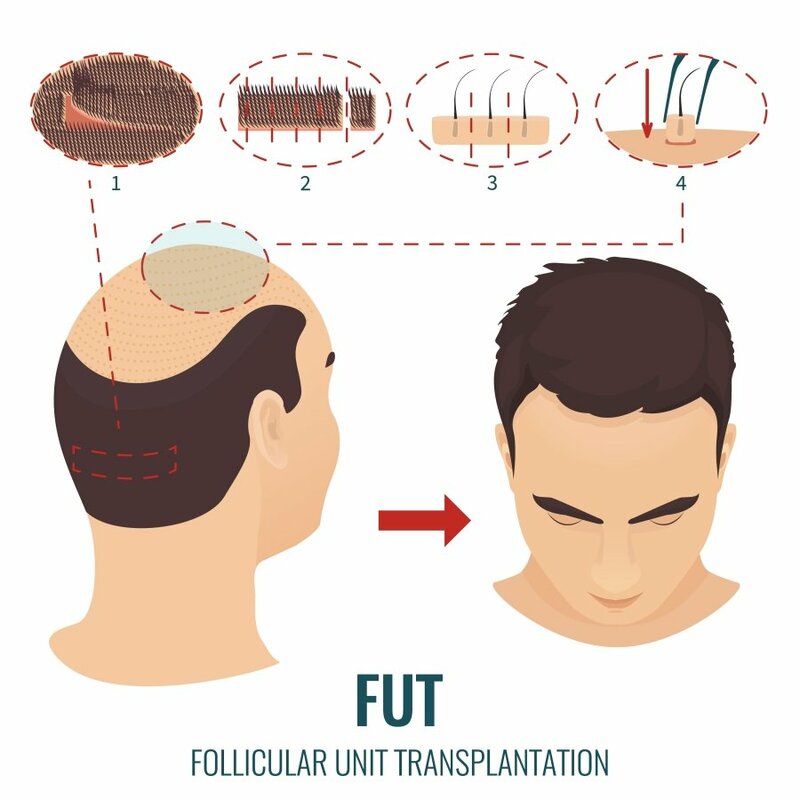 Find out which hair transplantation technique is best suited to your needs – Follicular Unit Extraction (FUE) or Follicular Unit Transplant (FUT). As unpleasant as it may be, hair loss is a normal part of aging, just like wrinkles and memory issues. If you’re self-conscious about your thinning hair, there are any number of steps you can take to restore your locks, ranging from hair restoration topical products and PRP therapy to non-invasive hair restoration surgery and scalp tattoos. In this article, we’ll focus on the two primary methods of surgical hair restoration — Follicular Unit Extraction (FUE) and Follicular Unit Transplantation (FUT). With both of these methods, follicular units (the skin organs that produce hair) are used to fill in areas of the scalp which have thinning or no hair. The primary difference is in the way the follicular units are extracted, either individually (in the case of FUE) or through the removal of a strip of tissue (in the case of FUT). You’ll want to make several considerations before deciding on your preferred type of hair transplant surgery — hair restoration cost, recovery time, scar appearance, etc. — to ensure that you get the appropriate result for your unique needs. Follicular Unit Extraction, also known as a follicular transfer, is the process of harvesting individual follicular units, which are extracted directly from the hair restoration patient’s donor area (the area at the back and sides of the scalp, where hair is considered safe for transplanting). During this procedure, a small, circular incision is made in the skin surrounding a follicular unit, which separates it from the surrounding tissue. The unit is then pulled directly from the scalp to leave behind a small, open hole. The surgeon repeats this process until he or she has collected enough follicular units for a complete hair restoration. With FUE, the process takes between an hour and two full days, depending on the needs of the patient. In many cases, FUE will be the preferred hair restoration surgery option for younger patients and those with conditions that may cause poor healing or scarring issues. That’s because the FUE method transplants follicles individually rather than in one large strip, which helps curb many common scarring, healing, and recovery issues. In some cases patients who’ve already had FUT will also undergo FUE in order to cover up their existing hair transplant scars. Less scarring — With FUE, there will be no linear scar in the donor area. If you tend to wear your hair short or have a history of scarring issues, FUE is one of the best hair restoration options available. This method doesn’t require any scalpels, staples or sutures. 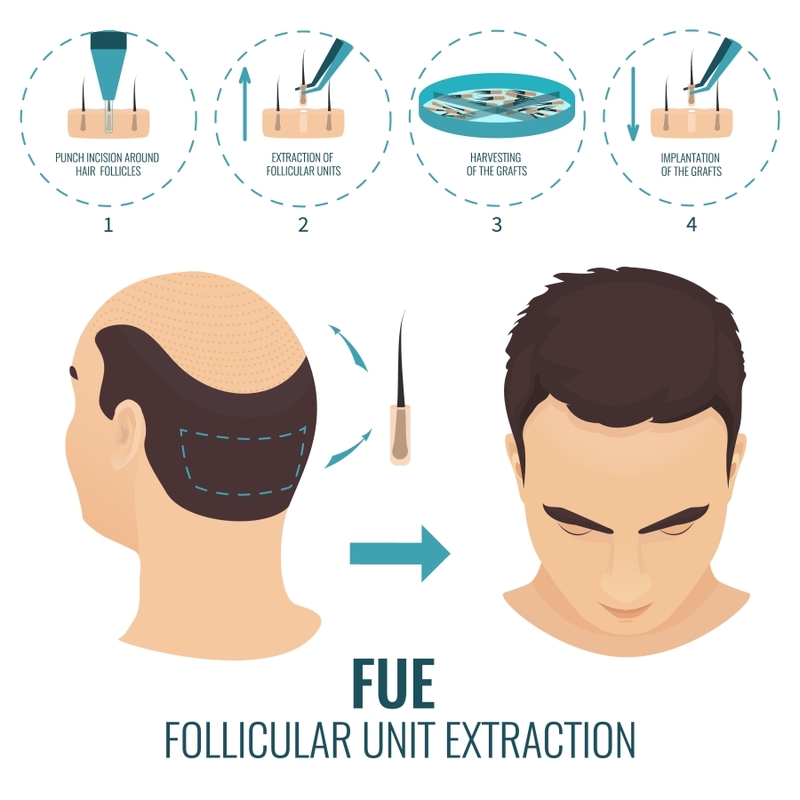 Quicker healing — Because FUE is accomplished by creating small holes, the affected area is more likely to heal faster than it would with FUT procedures, since FUT requires removal of one long strip of tissue from the scalp. Easier recovery — Generally, with FUE procedures, there will be minimal limitations on exercise post-procedure. That’s because the small holes are not at risk of widening in the same way that the strip wound caused by FUT is. This method is recommended for younger patients, athletes and those with more active lifestyles. May not last as long as FUT — With FUT, hair is harvested from a single area. On the other hand, in FUE procedures, follicular units are taken from a range of areas. Because of this, the donor zone may continue to thin and cause scars to become visible. Donor area must be shaved — If you’re against the idea of temporarily shaving your head, then this could present a problem for you. Because FUE requires transplanting using a variety of small holes, shaving the donor area is almost always necessary. However, there have been some recent hair restoration advances (such as a procedure called Long-Hair FUE) that may not require shaving. Graft issues — With FUE, there are greater risks associated with follicular unit grafts since there are more holes and more opportunity for trauma during placement. With the FUE procedure, grafts are more fragile and may cause issues such as buried grafts and capping, which occurs when the top of the graft pulls off during extraction. More expensive — Generally speaking, hair transplant procedures are charged on a per-session basis, meaning the cost will depend on how much work is required. Because the FUE method is more time consuming due to the individual nature of the procedure, it can be costlier than FUT. Follicular Unit Transplantation (FUT) restores hair growth by removing an entire strip of tissue from the donor area. Microscopic dissection techniques are then performed to transplant hair in the balding areas of the scalp. In one single session, surgeons can safely transplant thousands follicular units (groups of one to four strands of hair), which contain oil glands, nerves and muscles. With this method, follicular units more closely mimic the natural look of hair growth. For this reason, many people prefer the results of the FUT method over FUE. With that being said, FUT is not appropriate for all patients. Unlike FUE, the strip-removal nature of the procedure can create a larger scar. Additionally, intense physical activity – such as exercising at the gym – may be be limited for a significant amount of time following surgery with the FUT method. This is in order to mitigate the risk of any scarring issues, such as widening, from occurring. FUT is the older, more traditional method of hair transplantation. More natural-looking — The primary benefit of FUT over FUE is that it tends to result in a more natural-looking hair transplant. That’s because surgeons are able to graft several small areas at once instead of removing them individually, which makes the result more closely mimic natural hair growth. More affordable — The strip method allows specialists to work faster, so in most cases it’s likely this procedure will be the more cost-effective option. Can be performed faster — Although the differences in time associated with each procedure (one to four hours for FUE versus one to two hours for FUT per session) are relatively minimal, some people may prefer the shorter sessions associated with FUT. Doctors are able to remove up to 4,000 grafts per day with FUT, and only 3,000 per day (typically requiring two sessions for a single treatment) with FUE. May last longer than FUE — Because the strip method limits the donor area to the scalp, and because it’s easier to capture an entire follicular unit with this method, some patients have better luck with FUT in terms of how long the transplanted hair lasts. Prominent scarring — Because this method requires the complete removal of a strip of tissue, it will leave a permanent scar. Plus, the wound edges are generally closed with staples or sutures, creating additional scars. Slower healing time — Unfortunately, this method requires a longer recovery period. In some cases, doctors will limit a patient’s exercise and activity levels for several weeks following the procedure in order to prevent scar widening and other issues. Additionally, patients will need to have their staples or sutures removed two weeks into recovery. At risk for stretching — Those who partake in multiple FUT procedures over time may experience stretching of the scalp, which can worsen the appearance of the linear scar left by the FUT procedure. For this reason, FUE is often considered the preferred method for a second hair transplant.